The Committee's decision on all applications will be considered final. On November 30th 2012, Margaret Godson was thrown from a 3 year old TB, sustaining a broken pelvis in two places and a fracture of the tibia for which she under went surgery, having screws and steel plates put in place. She underwent 5-6 months of recovery, and it was 3 months before she could bear weight on her leg, which required extensive physio. Phillipa Hambly was injured at Glen Oro and required surgery and extensive dental work,physiotherapy and plastic surgery. Charlotte Palmer Benson was kicked in the face (!) by one of her horses, and suffered very serious injury. Basically lost all her teeth, almost ripped off her bottom lip, having to endure months of reconstructive surgery as a result. There were 2 applications to the Event Rider's Benevolent Fund this year. The first was Diana Burnett who broke her shoulder in a horse riding incident. The second was Meaghan Maloney, who fell XC @ Headwaters and broke her neck and was hospitalized and will have to wear a halo for several months! Eventing Canada! was hard at work this year supporting our Elite Riders again. This year the list included Diana Burnett of Blackstock, ON, Robert Holman of Hawkstone, ON, Chelan Kozak of Abbotsford, BC, Yves Landry of Napierville, QC, Bruce Mandeville of Puslinch, ON, Anita Nemtin of King, ON, Ian Roberts of Port Perry, ON, Garry Roque of Caledon East, ON, Penny Rowland of Orangeville, ON, Karl Slezak of Tottenham, ON and Graeme Thom of Hockley Valley, ON. Tricia Dahms: "Thanks so much for the very welcome sponsorship from Eventing Canada! It couldn't have come at a better time!" Look for Tricia to be back to upper level competitions this year with her new project: Auto Pilot. Anita Nemtin-Gilmour: "Thank you very much for your support and your tireless patience in getting my ADF working! Thanks for your Foxhall contribution, I hope I will make you proud. Many thanks." Ian Roberts: "Thank you for the support of Eventing Canada, it is most helpful in my quest." Chelan Kozak: "Thank you so much for the [bursary] from Eventing Canada! As you are well aware, this sport is very costly. Our trip is going well horse-wise, not particularly well trick-wise! Foxhall is in the sights and I am really excited to be riding advanced again….Many Thanks." Graeme Thom: "Thank you very much for your generous contribution to my 'England experience'. It was my first time competing overseas and I hope that it will not be my last. Arrow and I were in England for a little more than two weeks and could not have enjoyed greater hospiotality or facilities. After spending a week at the farm of David and Jackie Green we travelled to Blenheim for our 3 star competition. The competition started 115 horse/rider combinations. My goal had been to finish in the top 20, but a fall at the fourth from last evaporated this notion. While we finished the event, it was slightly disappointing. I say 'slightly' only because Arrow had jumped so perfectly over all the direct routes until then, and came out of the event as well as if he had gone for an hour hack. The experience of completing internationally is invaluable. By that I mean that being thrown in amongst the best riders in the world, riding a new and challenging course, dealing with the logistics of trans atlantic horse transport etc etc etc were all elements that will help to make Canadians ever better competitors on the international stage. Eventing Canada(!) should be extremely proud of their efforts and contributions to our sport! Thank you!" Bruce Mandeville: "Thank you so much for your help for Badminton. Very much appreciated. It was a great experience…. AND thanks very much for the Fair Hill help…. See you at the PAN AMs." 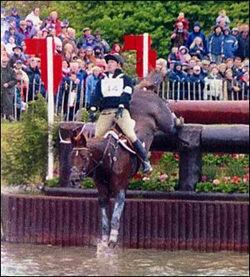 Bruce Mandeville, wrote "Eventing Canada [! ]s help at Fairhill was very much appreciated. Thanks very much…"
Hawley Bennett: "I just wanted to send out a HUGE thank - you to eventing Canada. I was a member of the Silver medal team at the Pan Am Games and I just wanted Eventing Canada to know that "Livingstone" and my self could not have achieved one of our long time goals of representing our country without the continued support of Eventing Canada. It costs alot to get to the top and we totally appreciate all the support and funding recieved from you! Hopefully we will make Canada proud this year in Athens! Happy Eventing!!!" Mike Winter: "I would like to thank you and Eventing Canada for your generous contribution to our Pan American Championship efforts. As our success would not have been possible, without your help." Leslie Grant, who was kicked in the ribs by one of the youngsters at Hugh Graham's Kingridge Farm where she works. She broke several ribs and couldn't work / sit for several weeks! Leslie had this to say: "I received the Eventing Canada(!) cheque today and was completely shocked at how generous it was. It was not at all what I expected. I cannot believe how kind you are. I so appreciate all you do for us. I cannot think of any other horse organization/committee that cares so much about Riders. This said, there is no way that I in good conscious can accept the amount you sent. It just isn't right. I have kept the amount that I lost when I could not work. But now I am back at work doing website editing, breeding research and other non-physical tasks, so I have enclosed the balance. Thank you so much." 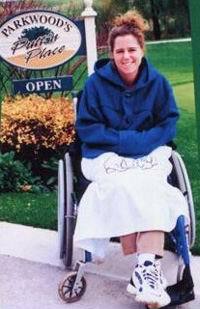 Karen Brain, who is still on the mend after a serious fall in September 2001. She has been really inspirational in her recovery, , and had this to say: "Thank you, once again, for your very generous contribution from the Riders Benevolent Fund! I am very grateful for all the support you have shown me over the last couple of years, since my accident, and hope you understand just how much it means to me. It seems that Eventing Canada(!) has always been there for me, and your timing, once again, couldn't have been any more perfect! Than you again, with all my sincerity." Corry Boyd, who broke her arm from a fall off a young horse, and had this to say: "Thank you so much for the money from the benevolent fund it really came in handy. I can't tell you how much I appreciate your help." This year we were lucky enough to be able to award two sets of Youth Bursaries . The first set of bursaries was provided in honour of our beloved Heather Wellman. It was Heather's wish that the money which her many friends donated to Eventing Canada [! ], be directed to the formation of a bursary supporting a young athlete who participated in the Sport of Horse Trials and Three Day Event. This year's recipients were Amanda Beard of Orillia, ON and Ursula Selby of Grand Valley, ON. The second set of bursaries was generously donated by Ms. BELLA WHITE of Toronto, who said, "I believe that all young equestrians should be able to pursue their dreams. I hope that these bursaries will provide additional opportunities for young eventers to learn, care for, and compete with their equine partners to further their equestrian goals." Recipients were Joel Hamilton of Thornton, ON, Meghan Hewitt of Smiths Falls, ON, Amelia Jones of Bobcaygeon, ON, Holly Martin of Oshawa, ON and Jessica Ruppel of Feversham, ON. Tricia Dahms: "Thanks so much for all the support. Carson & I have declared for the WEGs and your financial assistance makes it happen! I have tremendous appreciation for the efforts you make to support our athletes. Thanks so much." Bob Holman: "I was both surprised and appreciative of your generous support. On behalf of both myself and 'A Criminal Mind' let me say THANK-YOU to ... the members of Eventing Canada! As you know, campaigning a high level event horse is indeed a costly endeavour without much monetary return." Diana Burnett: "Your support this year and other years is greatly appreciated. The riding experiences that Eventing Canada(!) ... have made possible for me have turned out to be some of the greatest experiences of my life. Thank you!" Graeme Thom: "I would like to thank you very much for your generosity and consideration in sending me funding to help support my 2002 eventing season. The season will hopefully be a long and successful one. ... [My] very ambitious schedule ... illustrates why I am so thrilled to have received your generous sponsorship. Thank you again." Chris was leading horses to the paddock on January 1, 2002 - he had just released one of the two horses into it's individual paddock and was in the process of releasing the second horse when it reared up hitting him in the mouth with it's hoof. His jaw which was broken in two places. He has lost four upper teeth and two lower teeth. We wish him a speedy recovery and hope to see him out at events in the spring! "I am very grateful to Eventing Canada for the very generous contribution - it will definitely be a big help towards paying my dental bills. I am healing very well and have been back in the saddle for a few weeks but have not yet been allowed to jump. I am hoping to have made a full recovery before the end of the eventing season." As of April, Chris is definitely on the mend and is one of the Young Riders contending for a spot on this year's team. Karen Brain: "Thank you once again for Eventing Canada's wonderful support!!! " "Since you've been more than generous with your support and amazing donations to me I would like to do something for Eventing Canada. I just recently read about your fund raising clinic [Ride for Riders] that you are hosting again [June 30, 2002] and would like to donate my services for the day for the cause. I know it is a fund raiser for the Riders Benevolent Fund and would love to give back to the very fund that has so kindly helped me out during my time of tragedy.... it is a way I could give back to Eventing Canada, and it would make me feel good personally knowing I was helping to build back up the fund for someone else should another need the help of Eventing Canada's generosity in the future! " Thank you again ... for your continued support towards me, I can't express enough how much it means to me and how much your cheques have helped me get over the worst of it! I look forward to getting out there and being apart of the Eventing world again". 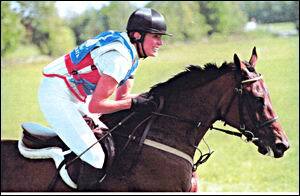 2001 was another good year for Eventing Canada[!]. For those of you who wonder what it is that we really do, here's a summary of what happened in 2001. "Thank you for your generosity and selfless support of our sport and its athletes. You have made all the difference to me personally, and helped to make this year so triumphant." The Elite Riders received a total of $11,750. Among them were Tricia Dahms, of Rocky Mountain House, AB, Yves Landry of Napierville, QC, Bruce Mandeville of Puslinch, ON, Anita Nemtin of King, ON, Ian Roberts of Port Perry, ON, Garry Roque of Caledon East, ON, Penny Rowland of Hockley Valley, ON and Lesley Grant of Uxbridge, ON. Here's what those athletes had to say…. Yves Landry: "I would like to thank you very much for your sponsorship at the beginning of this 2001 competitive season. I realize that you must get many requests for support and really appreciate your generosity towards my efforts. I am happy to participate in your fundraising activities and will do my best to spread the word of your association's efforts to promote the sport." "I would like to thank you very much for the financial assistance for the fall events from Eventing Canada….once again you help us continue and try to reach our goals. … You are certainly a great supporter of Yves and others and we would probably not continue if we did not get financial help from [organizations] like you[rs]." Bruce Mandeville: "I would like to thank the Board of Eventing Canada(!) for their continued support of Eventing. Your efforts to raise money for our sport are greatly appreciated. I am personally appreciative of the money received for my Level III course in 1999 and for money received from the Benevolent Fund in 1998. Financial and moral support helps clear the road to success." Ian Roberts: "Thank you for the help and support of Eventing Canada to my continuing campaign to reach my sporting goal." Anita Nemtin-Gilmour: "I would like to thank you very much for your donation … to help support my 2001 competitive season … it is greatly appreciated." Tricia Dahms: "Thank you so much for all your help in the struggle for the appeal and betterment of the sport in Canada. Canadian riders owe you a debt of gratitude." Penny Rowland: "Thank-you sooo much for your contribution to my efforts at Burghley. I will most definitely acknowledge Eventing Canada whenever possible to both the CEF and CET and the others I meet and compete with during the season." This year we were able to support 10 Young Riders to the tune of $10,000 in total through our Youth Bursary: Diana Burnett of Blackstock, ON, Lisa Courtney of Mississauga, ON, Karen Ellison of Ottawa, ON, Jessica Ferguson of Uxbridge, ON, Samantha Jones of Queensville, ON, Jennifer McGuire of Uxbridge, ON, Leahona Rowland of Kelowna, BC, Shannon Thompson of Summerland, BC, Stacey Thorson of Langley, BC and Scott Vanjoff of Midway, BC were the successful applicants for these ten prestigious bursaries. Here's what they had to say…. Diana Burnett "Thank You! With a very exciting and challenging part of my eventing career ahead of me your generosity comes at a most opportune time to help me accomplish my goals. … Funding this exciting trip [Fairhill] would have been neat to impossible without your generous support. ... Thank you very much, your support is greatly appreciated." Jessica Ferguson "I sincerely appreciated being selected as one of the 2001 Youth Bursary recipients. 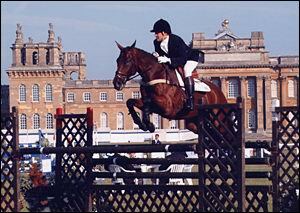 This sponsorship allowed me to reach all of my goals throughout the 2001 eventing season. … I am very grateful to have been chosen… Thank you for the opportunity." Leahona Rowland "Thank you all at Eventing Canada for your generosity and time that has made this bursary happen. I appreciate what you are doing in order to help young riders like myself pursue our eventing careers. I know this bursary will help me with my efforts to reach my competitive goals. Thank you all once again." Shannon Thompson "Thank you very much for choosing me as one of the 2001 Eventing Canada Youth Bursary recipients. I feel very honoured and fortunate to have been selected." "Your efforts for the spirit of eventing in Canada are highly admired and appreciated". Stacey Thorson "This has been GREATLY appreciated, thank-you so very much." Scott Vanjoff "I would like to thank you again for choosing me as a recipient of this bursary. It is a very good incentive for Young Riders. It has enabled me to take clinics and travel to events this season that I would not have been able to do without this money." Also a total of $3500 was donated to Organizers. This year, the recipients were Glen Oro in Hawkestone, ON and Headwaters in Erin, ON. Karen Brain "I've been meaning to write to Eventing Canada! for their more than generous donation towards my present position. ... it's taken until now to have any time and energy to get to all my thank you's. Please pass along to the rest of the Directors and of course Arthur how beyond thankful I am for Eventing Canada's! great support! So many things have come up that I would never have known I would need and your kind donation has helped provide me with essential equipment that I now need." "I want to thank you for your very generous donation to my 'help fund' since my accident. You have always been so supportive of me and my riding, and once again your wonderful generosity never ceases to amaze me!"